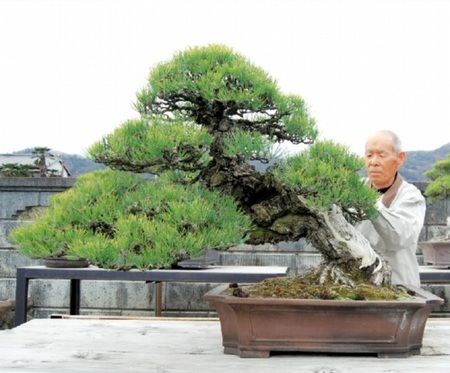 Fujiyoshi Kandaka, the 3rd generation of Kandaka Shojuen bonsai garden in Takamatsu's Kinashi town, is a famous skillful artist as the representative of Kagawa's bonsai world. He has a 60 years career in bonsai and the relationship with famous people in and out of Japan through bonsai. His way is to grow good trees with much care. So there are many painstaking masterpieces at his garden. There is a tree in his garden which he cherishes the most. 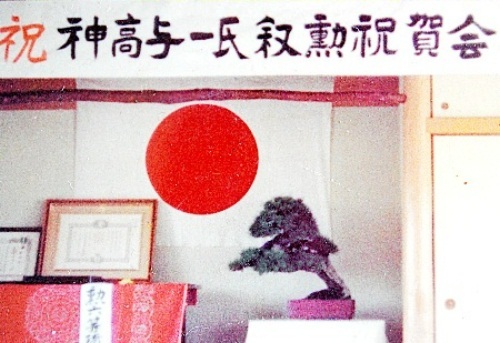 It is a Kuromatsu displayed in the celebration on April 29 in 1975 when his late father, Yoichi, received the Sixth Order of the Sacred Treasure, Silver Rays for contributions to promotion of bonsai. His late father praised the tree for the first time. When he got it from Kumamoto, he carried by himself, but now it is hard to move by two people because it is so large. Judging from the great Shari (decayed trunk), it is over 150 years after getting from a mountain. It has been 41 years since his other Nishikimatsu was displayed in the 45th Kokufu-ten bonsai exhibition and it produces the taste beyond description. We asked Kandaka about the key of care. "Be careful of water, fertilization, and disinfecting. In addition, make a space among needles and get a good sunshine," he answered the importance of the daily care. He thinks training should not end just once and it is good to work over the plan dividing into the different steps. There is nothing like time and steadiness. Something good happened to Kandaka. The eldest son, Keiji, is now the 4th generation and serves as the President of Kinashi Ueki Bonsai Center. Following Keiji, his grandson, Kohei, who just graduated his university in this spring, starts to study bonsai in a famous garden in Kyushu to be the 5th generation. "I'm happy to work with my grandson. I hope he learns a lot from his boss, so I must be fine until he comes back," he says with smile. 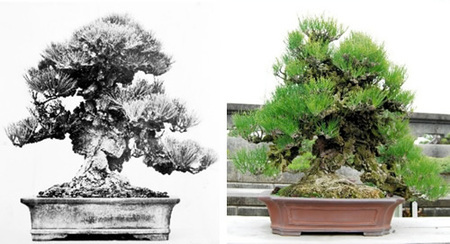 Now it is rare the three generations works together for bonsai. The big pleasure makes his life to be fuller.